Fad diets come in cycles, fluctuating to match popular prevailing attitudes toward nutrition. Fear of dietary fat spurred the creation of dozens of “fat free” processed snacks, but it wasn’t long before carbohydrates took center stage as dietary villains. Fast on the heels of the low-carb trend, the media declared fat to be vindicated and put butter back on the menu. What’s the difference between Keto, Low-carb and Paleo diets? How does the body enter ketosis? How fast can you enter ketosis? Proponents of “going keto” claim it improves heart health, reduces problems associated with diabetes, gives you more energy and is preferable to low-fat diets for weight loss. If such success stories have made you wonder whether a ketogenic diet is worth trying, it’s important to note the known side effects, documented adverse reactions and potential risks of undertaking such a restrictive regimen. In a normal state, your body uses glucose obtained from carbohydrates to make energy. When carbohydrates are broken down, the resulting simple sugar can be used as a convenient fuel source. Extra glucose is stored in your liver and muscles as glycogen and is broken down through a process called glycogenolysis if extra energy is needed in the absence of dietary carbohydrate intake. Restricting the amount of carbohydrates you eat causes your body to burn through stored glycogen and begin using fat for fuel instead. In the process, byproducts called ketone bodies are produced. You enter a state of ketosis when these ketones build up to a certain level in your blood. The body will only enter ketosis if blood sugar drops low enough to require alternative fuel from fat. Ketosis shouldn’t be confused with ketoacidosis, a complication associated with diabetes. In this serious situation, a lack of insulin causes an excess of ketones to flood the bloodstream. If left untreated, this condition can be fatal. Diet-induced ketosis is meant to keep ketone levels low enough to avoid a state of ketoacidosis. To trace the roots of the keto diet trend, you have to go all the way back to 500 B.C. and the observations of Hippocrates. The early physician noted fasting appeared to help control the symptoms we now associate with epilepsy. However, it took until 1911 for modern medicine to conduct an official study on how caloric restriction affected epileptic patients. When the treatment was discovered to be effective, doctors began using fasts to help control seizures. Since it’s not possible to stay on a fast forever, another method for treating the condition needed to be found. In 1921, Stanley Cobb and W. G. Lennox discovered the underlying metabolic state caused by fasting. Around the same time, an endocrinologist named Rollin Woodyatt conducted a review of research relating to diabetes and diet and was able to pinpoint compounds released by the liver during a state of fasting. These same compounds were produced when people consumed high levels of dietary fat while restricting carbohydrates. This research led Dr. Russel Wilder to create the ketogenic protocol for treatment of epilepsy. In 1925, Dr. Mynie Peterman, a colleague of Wilder’s, developed a daily formula for the ketogenic diet consisting of 10 to 15 grams of carbohydrates, 1 gram of protein per kilogram of bodyweight and all remaining calories from fat. This allowed the body to enter a state similar to starvation in which fat was burned for energy while providing enough calories for patients to survive. The protocol was designed to address severe epilepsy unresponsive to traditional treatments and wasn’t intended for the general population. Other therapeutic uses of ketogenic diets are still being investigated, including potential positive effects for Alzheimer’s, autism, diabetes and cancer. Why is “Going Keto” so Popular? Part of the reason why people accept this way of eating so readily is the deeply entrenched idea of the need to “burn fat.” Fat-burning “zones” have long been coveted as the gold standard for exercise, and the idea of burning off unwanted fat is attractive to anyone looking to shed excess pounds. Many people do lose weight when going keto, at least at first, but most of what comes off is the result of water loss and the depletion of glycogen stores in the muscles. You also get to eat a lot of fat on a ketogenic plan. In fact, keto diets suggest getting the vast majority of calories from dietary fat. This means you’re free to put butter or coconut oil in your coffee, eat your way through piles of eggs and cheese at any meal and cook chicken in lard if you so desire. After decades of trying to follow recommendations for a low-fat diet, many people see going keto as a license to eat the way they’ve always wanted to without feeling guilty. What many don’t realize is ketogenic diets, like most fad diet plans, require maintaining a caloric deficit. 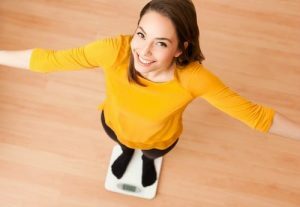 Routinely eating fewer calories than you take in will result in weight loss over time, although some people hit a plateau once their bodies adapt to the caloric restriction. 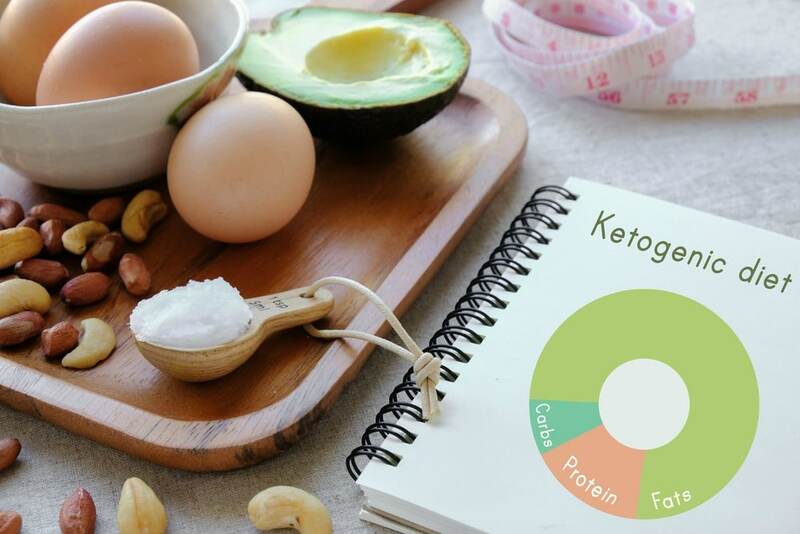 The keto trend falls under the umbrella of the “low-carb” diets made popular by the Atkins craze and recently repackaged under the “Paleo” label. If you’ve followed either diet plan before, you’ll recognize some of the same characteristics in the ketogenic diet, including the reduction or elimination of many carbohydrate-containing foods. We’ve also written extensively about Paelo vs Keto Diets. On low-carb diets like Atkins, you can only consume a certain number of “net carbs” per day, calculated by subtracting the amount of fiber in a food from the total carbohydrate content. Adhering to the Paleo model means eating what many believe their “ancient ancestors” ate. Paleo diets eliminate grains, legumes, dairy products, potatoes and processed foods. Both diets recommend getting at least the RDA for protein, which is 0.8 grams per kilogram of body weight, and the remainder of calories from fat. 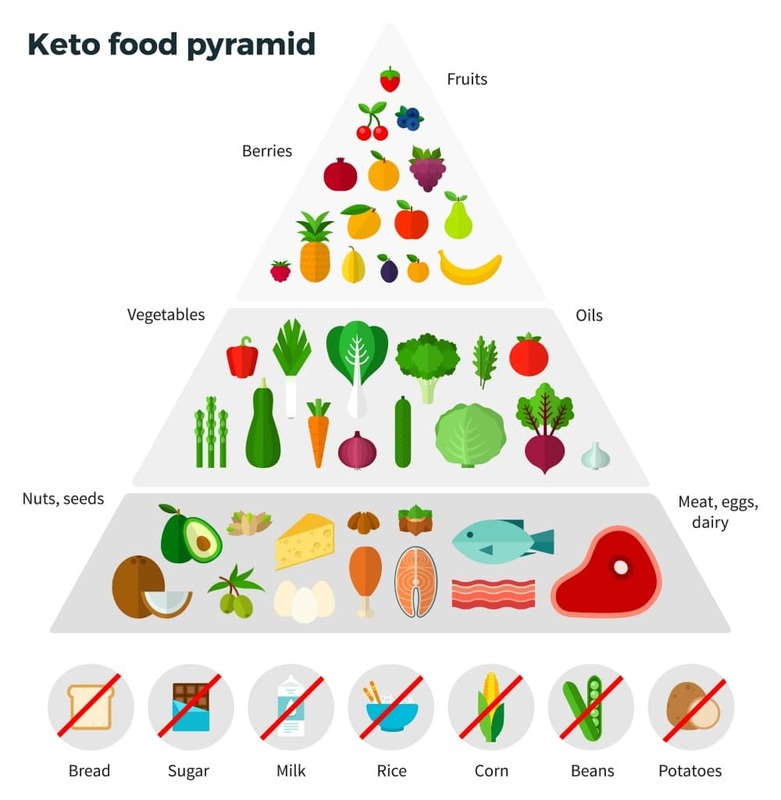 Ketogenic diets take this concept even further, dropping carbohydrates to about five percent of daily calories and recommending 70 to 90 percent of calories come from fat while largely avoiding processed foods. This makes it lower in protein and carbohydrates than both Paleo and Atkins. Like the Paleo diet, ketogenic plans lack long-term studies showing effectiveness for weight loss and overall health. Bumping up your fat intake to such high levels leaves very little “wiggle room” for consuming other macronutrients, and carbohydrates are restricted the most. The modern ketogenic diet keeps carbohydrates to under 30 grams a day. Any amount higher than this prevents the body from going into ketosis. Proponents of the keto diet claim blood testing is the most accurate of the three due to the types of ketone compounds it detects. How Quickly Can You Achieve a Ketogenic State? It’s important to note these ideas aren’t based in science and haven’t been evaluated for safety. Rapidly changing the way your body works and the types of foods you eat puts stress on your system and can lead to unpleasant side effects. Can You Stay in Ketosis as Long as You Want? A search for studies on long-term ketogenic diets turns up reports covering protocols lasting one to two years, but no studies have yet looked into the effects of adopting the extreme dietary pattern as an ongoing lifestyle. Despite apparent beneficial effects in the short term, both the American Heart Association and the Obesity Society agree there’s not enough evidence to show staying on a ketogenic diet indefinitely is good for you. Physiologically, it’s possible to keep your body in ketosis by continuing to restrict carbohydrates, eating a lot of fat and sticking with moderate amounts of protein. To do this, you have to be comfortable with the content of a typical ketogenic menu. Dishes include large amounts of meat, fish, eggs, low-carbohydrate nuts, oils, butter, high-fat dairy products and non-starchy vegetables. Foods such as lard and tallow, which people have avoided for decades due to their potential to cause adverse health effects, are recommended and encouraged. Many people find this type of diet difficult to maintain, especially in social situations. The lack of fruits, vegetables, legumes and grains in the eating plan also puts you at risk for deficiencies of essential vitamins and minerals, including vitamin C, magnesium and potassium. There are specific situations in which going into ketosis is considered or known to be unsafe. It’s no surprise adhering to a diet meant to mimic a state of starvation can lead to unwanted side effects. Described by ketogenic diet proponents as “keto flu,” there are a number of common problems. How long symptoms last depends on how well the body adapts to the extremely low carbohydrate intake. Nearly all of these complications can be traced to the skewed balance of macronutrients in a ketogenic diet. Health professionals have expressed concern about the lack of carbohydrates, citing potential problems with hormones related to muscle building, thyroid health and stress. Both the initial symptoms of “keto flu” and more severe reactions give credence to these concerns. Going on a ketogenic diet means eliminating nearly all fruits and a large number of vegetables, all of which contain fiber essential for the health of your digestive system. Current research is uncovering connections between the number and types of microbes present in the human gut and the risk for chronic diseases. By drastically limiting carbohydrates, the keto diet removes most sources of beneficial fiber and starves the gut’s microbial community of its primary food. This can not only cause digestive discomfort but also increase your likelihood of developing other diseases in the future. Antioxidants from fruits and vegetables are necessary to help your body protect itself against cellular damage. Few antioxidants are found in the foods on a keto menu, with the exception of some high-fat plant foods and a limited number of low-starch vegetables and low-sugar fruits. Beans and grains, two other foods completely excluded, provide more antioxidants along with fiber and a range of important nutrients, including the healthy dietary fats touted by advocates of going keto. Your body requires adequate protein to build tissues, repair damage and maintain muscle mass. Getting enough protein may not be a problem on a ketogenic diet, but some people might fall short of what they need depending on activity level and the sources from which dietary fats are obtained. Lack of protein can decrease lean muscle, stall weight loss and lead to fatigue. Although there’s still quite a bit of debate over whether high fat intake, particularly saturated fat, is associated with an increased risk of heart disease, prevailing evidence suggests the keto pattern of eating can have adverse effects on blood flow in your arteries and may lead to an increase in atherosclerotic plaques. However, intake of refined carbohydrates can also negatively affect heart heath, which may explain why some people switching to a high-fat, low-carbohydrate diet initially see good results in their bloodwork. In extreme cases, ketogenic diets may cause heart problems severe enough to lead to death. This was observed in two children put on the diet for epilepsy. Both suffered from selenium deficiency and died suddenly as a result of irregular heart rhythms. While this isn’t common, it suggests you need to be extremely cautious about getting the right amounts of essential nutrients on a ketogenic plan. Reports of kidney stones developing in children following a ketogenic diet for the treatment of epilepsy have generated a debate in the keto community about whether or not ketosis is problematic for kidney health. Opinions are split between those saying it’s definitely a concern and others claiming you only have to worry if you have an existing kidney condition. The prevailing thought is, as long as you keep protein intake under control, a ketogenic diet should pose no threat to your kidneys. Since scientific evidence of the effects of a truly long-term keto diet on health is lacking, there’s no way to know for sure if eating predominantly high-fat, low-carbohydrate foods while maintaining low to moderate protein intake will cause kidney stones in healthy people. If you already have a tendency to develop kidney stones, changing your diet to achieve ketosis could increase your risk. One of the key pieces to the puzzle of why low-carb diets, including the keto diet, seem to help so many people despite the known adverse effects is the removal of refined carbohydrates. Many people switch from diets filled with white bread, added sugar, fried potatoes and other junk food to eating almost no carbohydrates at all. Even though these items are replaced with high amounts of dietary fat, keto diets tend to encourage the consumption of whole, unprocessed foods. Cutting out carbohydrates will also make you feel better if you have an undiagnosed gluten sensitivity, are addicted to sugar or suffer from fructose malabsorption. Working with a doctor to uncover hidden allergies and sensitivities and eliminating the foods responsible for your symptoms will have the same effect. Any diet in which highly processed, nutrient-poor convenience foods are removed will have some benefits for health, but the most successful eating plans are those focusing on a variety of plant-based foods and not putting extreme emphasis or restriction on any one macronutrient. Your body needs a balance of carbohydrates, protein and fat to function properly, as well as the range of antioxidant phytonutrients only found in the fruits and vegetables those on ketogenic diets so adamantly shun. Eating a wide range of whole plant foods is also much more sustainable than attempting to fuel your body almost exclusively with fat. Populations eating this way are among some of the healthiest and most long-lived in the world and tend to have low rates of the chronic diseases plaguing Western society. Although it is possible to lose weight on a ketogenic diet and some studies show short-term improvements in several biomarkers of health, the long-term risks of eating large amounts of dietary fat while severely restricting carbohydrate intake are not yet understood. Making an informed decision about whether or not to follow the keto fad or any diet trend requires a careful look at the science to understand what the real driving forces are behind any apparent health claims. Read more about sustainable weight loss. You should never undertake an extreme fad diet just to see if it works without knowing how it could affect your body and why. Since the ketogenic diet was originally designed to treat severe epilepsy in children under medical supervision and has only recently entered mainstream culture as a method for weight loss, it bears considering whether maintaining ketosis in the long term is safe for the average person. Large bodies of scientific evidence coupled with decades of observations and anecdotal evidence suggest balanced diets including a range of whole foods may be the best choice when it comes to lifelong health. Very interesting details you have mentioned regarding some side effects and specific situations that will be considered unsafe to this diet. Seriously helpful information you’ll have stated.Thanks for the post! Keto doesn’t need to be a long term lifestyle though. There’s benefits of doing it just for a little while because it can long term get your body adapted to utilizing fat as an energy source, so that when you do restrict calories even if not in ketosis you’re more likely to start utilizing fat faster rather than converting muscle protein into glucose. A lot of people can’t even access their fat stores as an energy source because they’ve been on a high carb diet for so long. It doesn’t need to be a lifestyle, it can be utilized as a tool as needed. Thanks Josh, that’s a very good point. Appreciate the feedback. Interesting blog about Keto. Can you tell me at the age of 55 years old, do you think it is still good for me, to try this diet? Hi Johnna, I think the answer to this depends on a range of factors including your current health and diet. You should talk to your doctor and/or a nutritionist before embarking on a Keto diet. I have seen article where they talk about 10lbs per week, is that realistic and good for health?